Eagle Ridge showed he is a horse with a future when proving too good in Thursday’s 3YO Maiden (1400m) at Warrnambool at just his second start. Parked in fourth place along the inside to the home turn by Jordan Childs, Eagle Ridge was ridden along into the home straight and responded gamely, finishing too well for the favourite Pleasuring to score by a neck with Splashette a further two lengths back in third. Jordan Childs (pictured) was impressed with the way Eagle Ridge won his race. “We took advantage of the good draw and we enjoyed a lovely run,” Childs said. “To be fair to him he dug deep for me when I asked for an effort and he was strong to the line. Mike Moroney believes Eagle Ridge can only continue to improve. 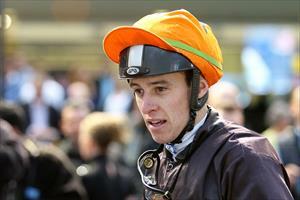 “I was impressed with the way he toughed it out today,” Moroney said. “We’ve always had a nice opinion of him and he has plenty of scope for physical improvement. Eagle Ridge was purchased as a yearling at the Inglis Premier Sale by Paul Moroney for $65,000. After a win and a placing from his two starts he has earned $46,800.